Be it weddings, birthdays or anniversaries capturing those precious moments to be cherished later is the trend followed by the youth these days. There is an increased demand for professional photographers in the market. They have come up with Contract Forms to make it easier to organize and also mention the terms and conditions clearly to the customers. The customers can choose the package of their choice among the mentioned packages in the contract forms. A wedding photography contract is something which is signed by the couple ensuring all the details of the wedding and the need of the photographer and the workload he will be taking will be specified. 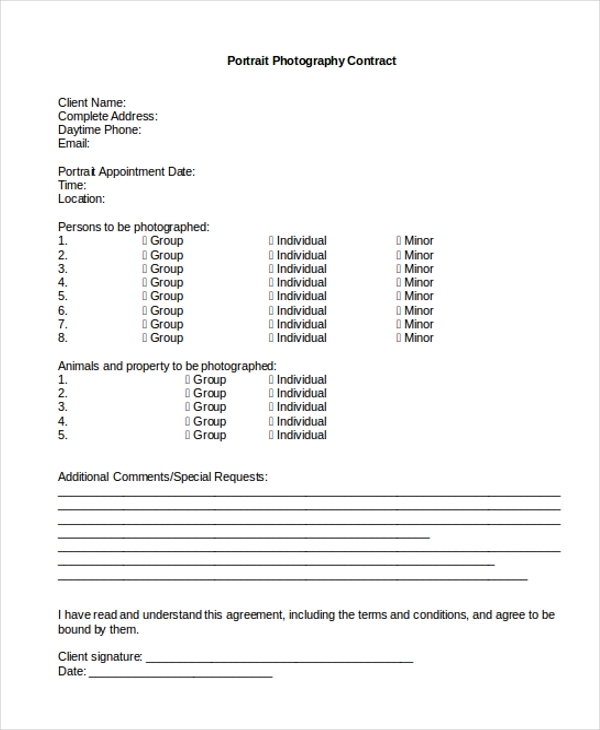 This sample photography contract is a general one wherein all the event details will be specified and the package the client side has to opt for will also be covered in the same. You may also see Land Contract Forms. 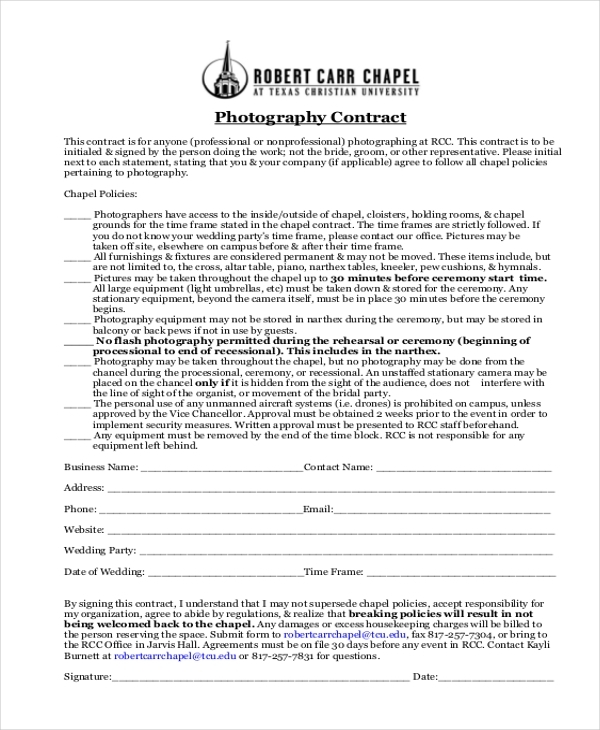 Just as the name says, this contract covers the event details and helps the photographer in understanding how much coverage he will be taking up. 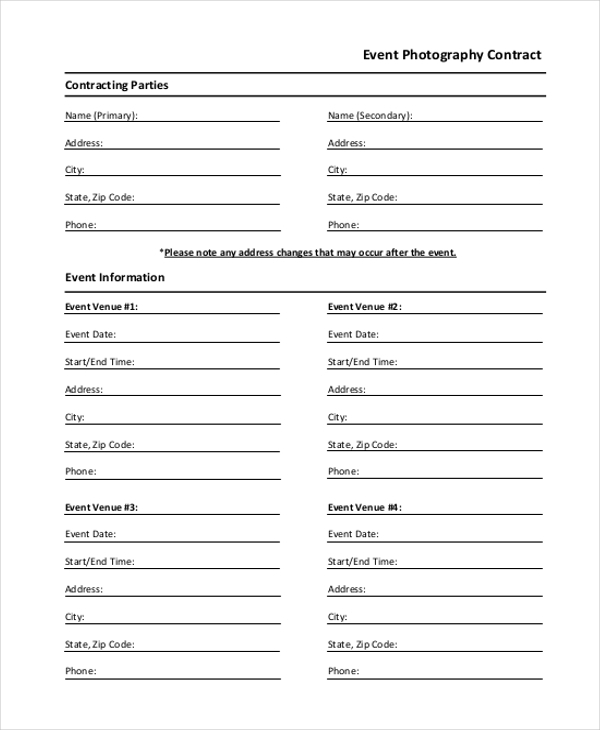 You can also see Event Contract Forms. 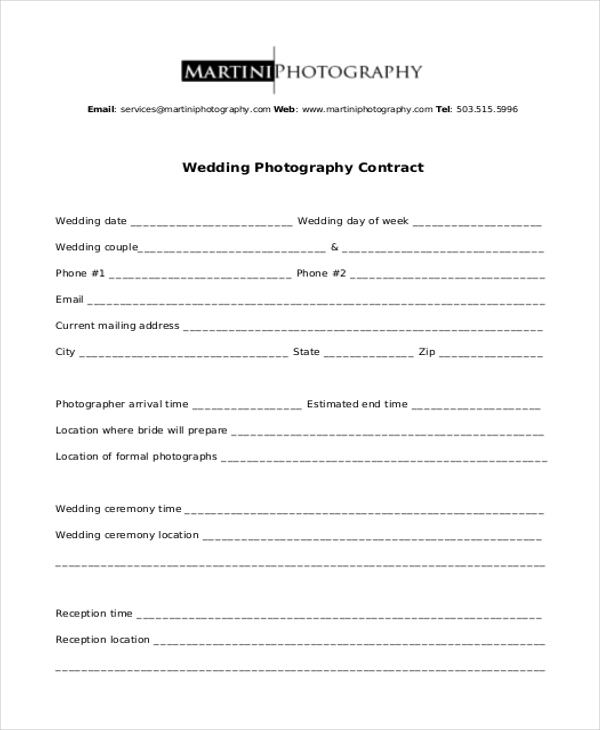 This kind of photography contracts is signed by the photographer, regardless of the person being professional or not. This can be produced by the owner of the place where the event is happening. 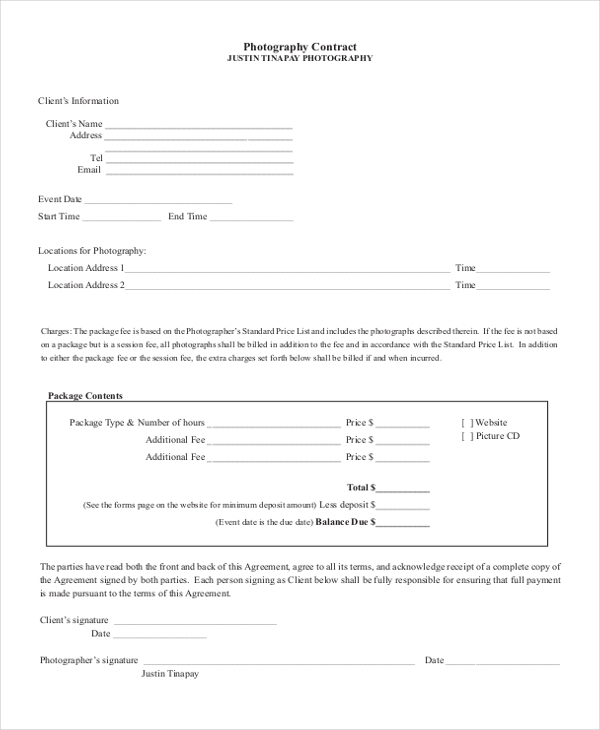 This photography contract is signed by professional photographers if a company is hiring them to do the services. This is authorized by the studio contact along with the details specified. 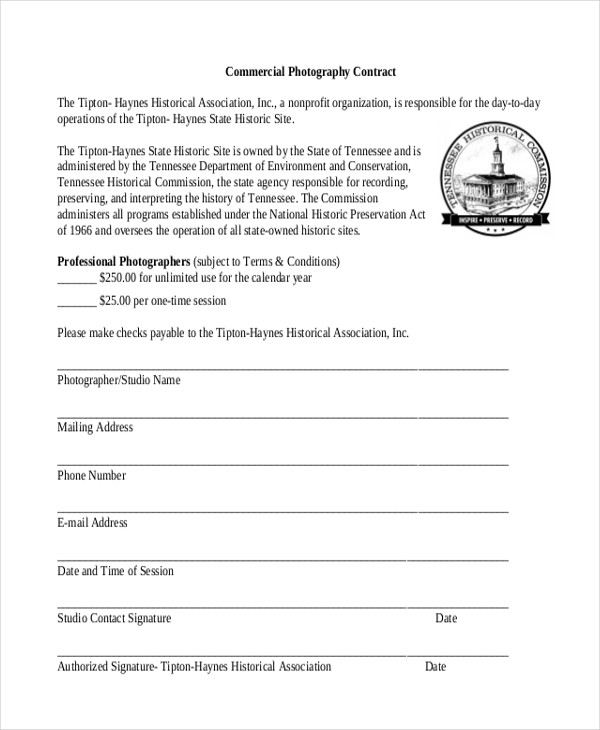 You may also see Photography Order Forms. This is yet another general photography contract wherein the details of the opted services will be provided and the rights on the material that each party hold will also be specified. You may also see Purchase Contract Forms. This contract is usually taken up for the engagement period by the couple. The services cover throughout the engagement ceremony and the copies will be provided to the clients and approved by the client by signature. This contract is used by the service provider to make sure of the chargeable time, payment-related terms and conditions, including the session type, theme of the event and other ideas. Usually, a headshot photography contract is used when one or a group of individuals are to be counted during the session and they are using their photographs for any passport uses or any related uses on the delivery time. 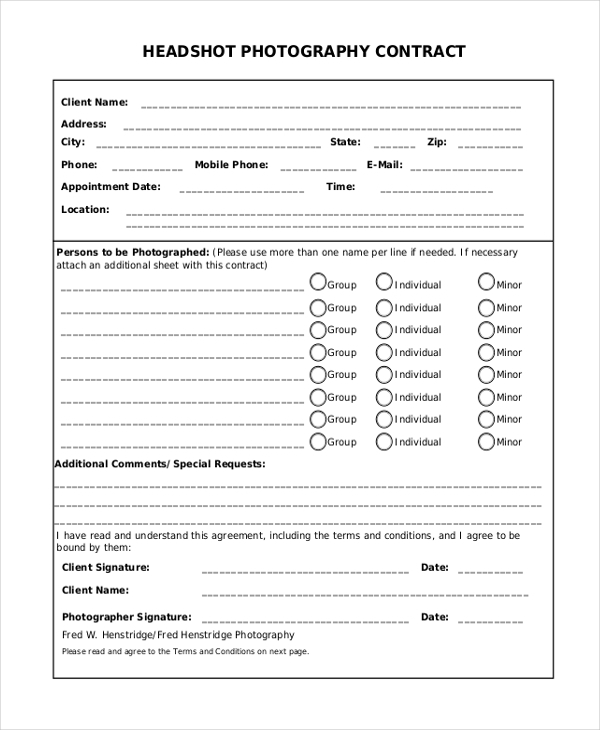 These type of contracts are taken specifically when a portrait photography is taken for an individual or a group or a couple. This also talks about the rights the parties hold. 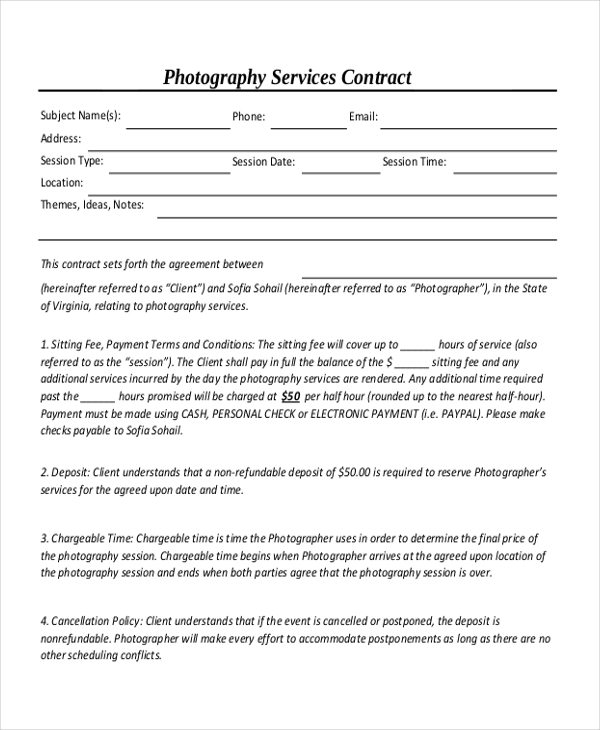 What are The Usage and Benefits of the Photography Contract? 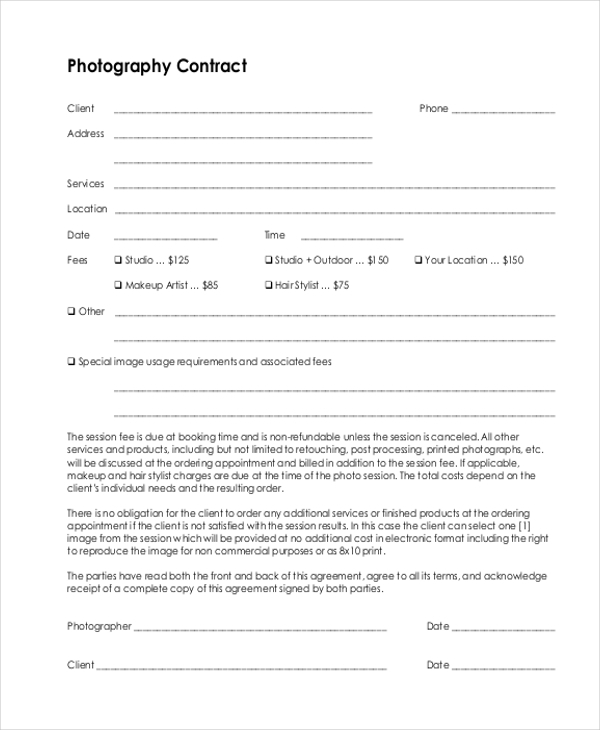 The purpose of a photography contract is clearly to make things formal and set the rules of the event regardless of its nature. This is at the primary stage accepted by both parties and with this, most of the possible conflicts are avoided in the very beginning. A clearly written contract will eliminate most of the miscommunications between the client and the photographer. When you are working with an unknown person, keeping it formal is really appreciated. This also shows the level of professionalism and offers protection for both ends. These photography contracts will genuinely improve the situation for both the ends. You may also see Employment Contract Forms. Who is the Target Audience of the Photography Contract? The target audience of the photography contract is clearly the event organizers and the photographers. Irrespective of the photographer, being professional or the otherwise, the contract is maintained by each and every one to ensure safety at both ends. The contract contains the rights and conditions, basic information including the delivery date. This helps the photographer to prove the genuineness of the client and the same for the other end. No photographer nowadays will take a shot to meet the millions of possible scenarios that will leave both ends regretting not having a written protection signed prior as the price is also cleared in the same. You can also see Car Sale Contract Forms. 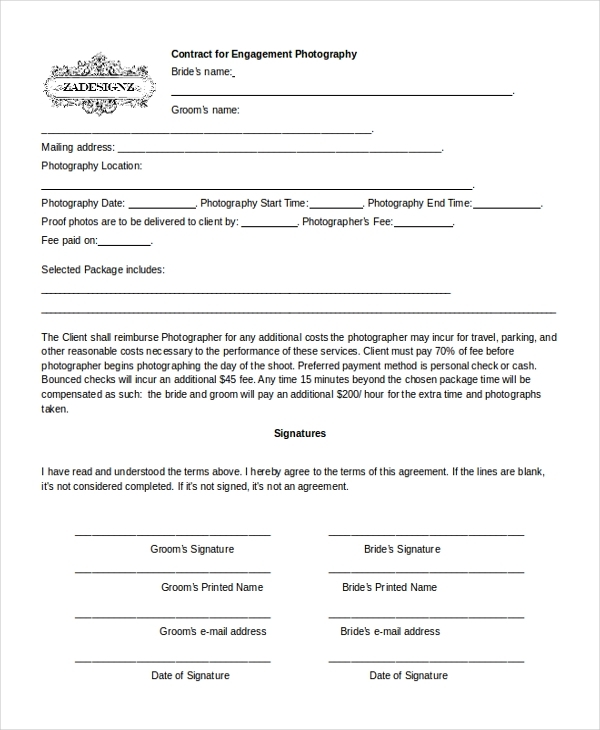 These are the different contract assignment forms that are widely used in the photography market. The client can choose any one contract form from the above mentioned depending upon the requirement. The payment can be made physically through cash or cheque and electronically through online transfer or using debit and credit cards.